Gail Pickens-Barger, left, teaches an adaptive yoga class targeting people with multiple sclerosis at Wesley United Methodist in Nederland. But not all students have MS. Some have osteoporosis, some are healing from infections and some come to the class in an effort to be more active. Adaptive Yoga relieves disease-induced pains. 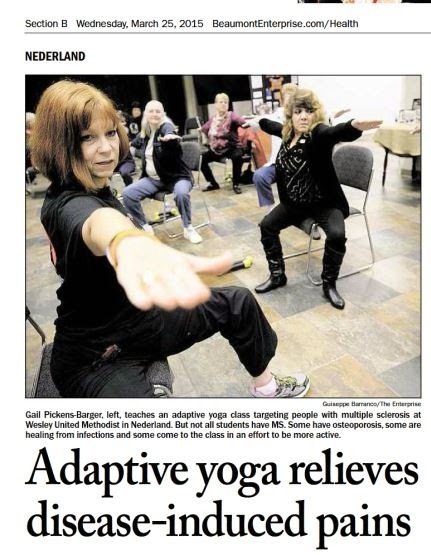 Adaptive Yoga relieves disease-induced pains. Students find balance in class addressing physical toll of multiple sclerosis. By Michelle Heath. Beaumont Enterprise. Gail Pickens-Barger reminds her students to breathe as they move into Warrior II pose. In the background, calming music echoes through the church foyer. Pickens-Barger’s soothing voice and airy instructions seem suited to a typical yoga class. But this session is for people with multiple sclerosis. Pickens-Barger teaches chair yoga fitness, a modified class, on Thursdays 10 a.m. at Wesley United Methodist Church in Nederland, Texas. 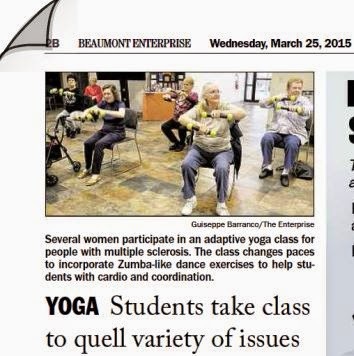 Beaumont Enterprise, Wednesday, March 25, 2015. Several women participate in an adaptive yoga class for people with multiple sclerosis. The class changes paces to incorporate Zumba-like dance exercises to help students with cardio and coordination. YOGA. Students take class to quell variety of issues.— at Wesley United Methodist Church, Nederland, Texas. YOGA. Students take class to quell variety of issues. Continued from page 1B. MS causes a multitude of health problems triggered when the immune system attacks healthy tissue in the nervous system, according to the National Multiple Sclerosis Society. Loss of coordination and lack of balance mean those suffering from MS aren’t typically getting any cardio exercise, said Pickens-Barger. Jenny Lavergne, 56, said she gets her only exercise through chair yoga fitness class. The Groves resident was diagnosed with MS more than two years ago. Her retirement as a cafeteria worker at Memorial High School soon followed. “I just struggled my last year (of work),” she said. When she bent down to grab something or took a tumble, she couldn’t pick herself up, she said. That fear kept her from working out. Lavergne said she’s noticed a change in her body and confidence since starting chair yoga fitness about a year ago. 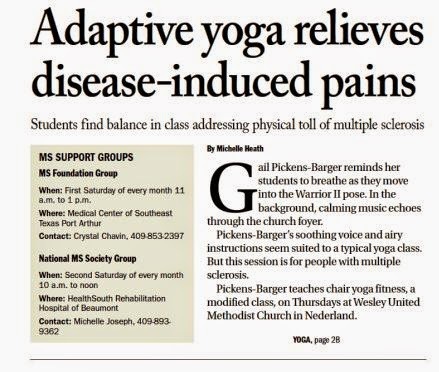 Not all the students at the Nederland chair yoga fitness have MS. A few have osteoporosis, some are coming back from crippling infections and others are just trying to be more active. As Pickens-Barger moves the class along, she changes pace to Zumba-like dance exercises. She said it helps her students with their cardio and coordination. Pickens-Barger likes to keep her class light, making jokes and offering words of encouragement. 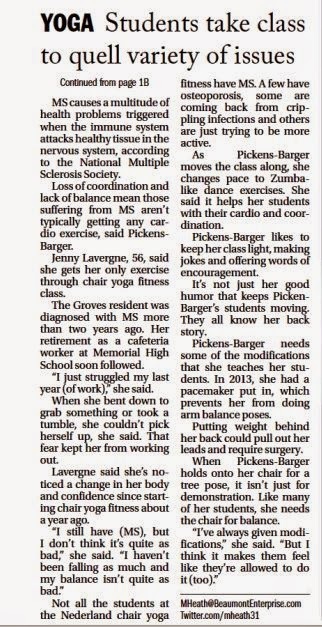 It’s not just her good humor that keeps Pickens-Barger’s students moving. They all know her back story. Pickens-Barger needs some of the modifications that she teaches her students. In 2013, she had a pacemaker put in, which prevents her from doing arm balance poses. Putting weight behind her back could pull out her leads and require surgery. When Pickens-Barger holds onto her chair for a tree pose, it isn’t just for demonstration. Like many of her students, she needs the chair for balance. Posted on May 10, 2015 by yogawithgaileee. This entry was posted in Uncategorized. Bookmark the permalink. 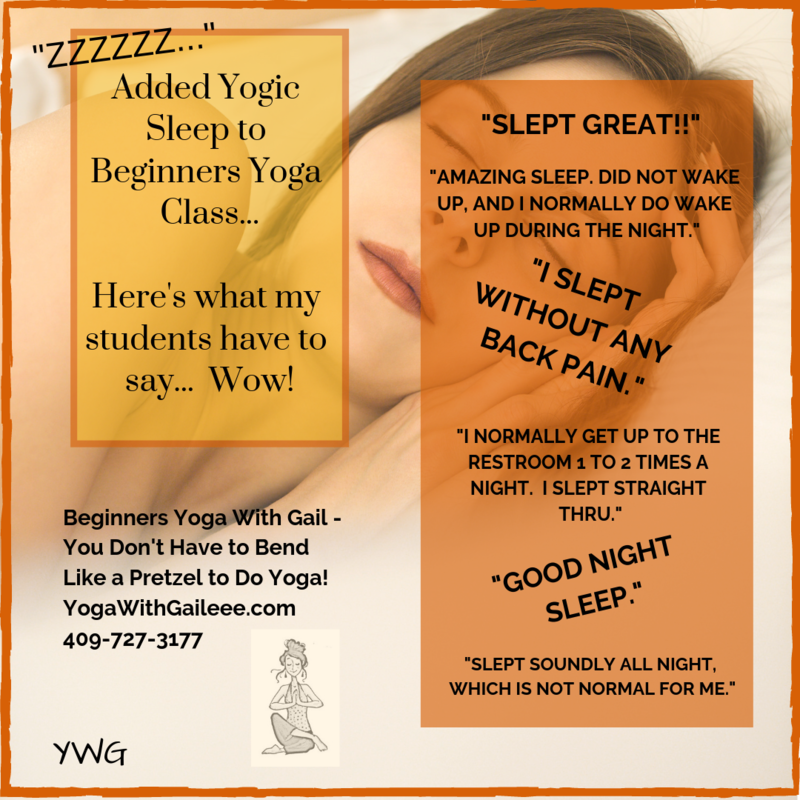 ← Yoga with Gail Pickens-Barger. Over 15 years of teaching experience.